New in new dust jacket. 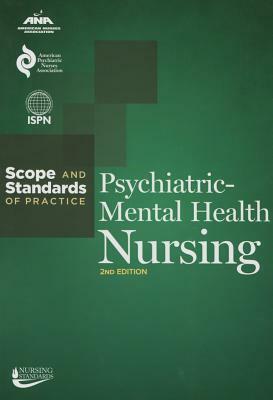 This newly published second edition is the definitive book covering the essentials of psychiatric-mental health (PMH) nursing applicable at all practice levels and settings. It articulates what is expected of all psychiatric-mental health nurses, specifying the who, what, where, when, why and how of their practice. It presents the underlying assumptions and characteristics, addresses matters of environments and settings as well as education and training requirements, and covers key issues and trends and the ethical and conceptual bases of the specialty. Moreover, it specifies the competencies for nursing practice and professional performance of all PMH registered nurses. While this foundational volume is primarily for those directly involved with psychiatric-mental health nursing practice, education and research, other nursing and allied health care providers, researchers and scholars will find value in this content. New. Trade paperback (US). Glued binding. 184 p. American Nurses Association. New. Trade paperback (US). Glued binding. 184 p. American Nurses Association. In Stock. 100% Money Back Guarantee. Brand New, Perfect Condition, allow 4-14 business days for standard shipping. To Alaska, Hawaii, U.S. protectorate, P.O. box, and APO/FPO addresses allow 4-28 business days for Standard shipping. No expedited shipping. All orders placed with expedited shipping will be cancelled. Over 3, 000, 000 happy customers. Fine. Trade paperback (US). Glued binding. 184 p. American Nurses Association. In Stock. 100% Money Back Guarantee. Brand New, Perfect Condition, allow 4-14 business days for standard shipping. To Alaska, Hawaii, U.S. protectorate, P.O. box, and APO/FPO addresses allow 4-28 business days for Standard shipping. No expedited shipping. All orders placed with expedited shipping will be cancelled. Over 3, 000, 000 happy customers.